A quick Cochon 555 shout out. Valentine's Day: In or Out? I started Orientation over at Mills College this weekend and have been going non-stop for the past four days. Luckily, I'm amazingly spoiled and Schaefer has been making sure that I have fresh biscuits in the morning for breakfast and a delicious dinner each night when I get home. Ahhhh....I am so lucky! Before I sign off with this week's menu I want to mention this amazingly delicious Corn Chowder, pictured on the left, that we had last week. 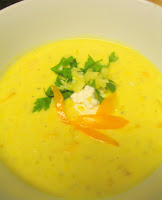 The chowder was incredible not only because of the sweetness and vibrancy of the corn, but because the corn season is at the beginning of the end and we're going to have to move on soon and say good-bye to the dish for a bit. But, don't despair too much, we'll be posting the recipe on Thursday so that you can enjoy it at home before all the fresh corn is gone! Monday: Blue Cheese Mac served with Fresh Green Leaf Lettuce. Merlot. Tuesday: Chinese Sausage and Long Beans cooked in a Black Bean Sauce. Mission Pale Ale. Wednesday: Chicken pitas dressed with herb yogurt, served with cucumber salad and black bean couscous. Chardonnay. Thursday: Green chile chicken empanadas, Spanish style rice and vinegar jalapeño coleslaw. Trader Jose Dark. Friday: Pizza topped with whatever looks good at the Farmer's Market! Red, red wine. mmm... Thursday sound particularly tempting. I could go for a Thursday right now, in fact.